If you follow me on Instagram, you may have seen that Dustin and I are on the rollercoaster journey of building a house!! It has been a fun and stressful few months that started back in June. We began working with our rockstar realtor, Debbie, back in May and after looking at countless homes online, we made the decision that we wanted to find a development in which we could build. This process was pretty easy and we fell in love with the third place we visited. Dustin and I knew we wanted to be north of Charlotte for work reasons, close to restaurants and shopping, and we wanted to have some amenities. Two weeks after first visiting we signed a contract to build our first home! After signing our contract, we had tons of decisions to make. 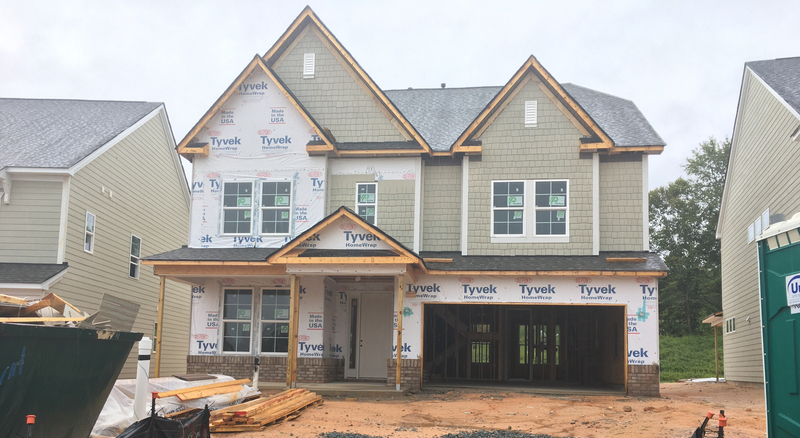 Our builder, Taylor Morrison, has a design center near Uptown Charlotte where they house all options for the design of the home. This includes everything from the exterior colors, to cabinets, to shower tiles. We had two weeks from the day we signed our contract to finalize all of our design decisions. We visited the design center on a “Preview Day” to take a look at all the options and narrow down what we wanted to help make our decision making process as smooth as possible. We had a great experience at the design center, despite being a bit overwhelmed. Our designer, Brittany, was so helpful and patient as we chose what our home would look like! Building within a development like ours is very different than building a custom home. We did not have to get a construction loan, which for us was GREAT! The options are somewhat limited and we did run into a few occasions where we would have liked a little more wiggle room or perhaps more flexibility with the options at hand. Overall, we are so excited for everything we have picked and I can’t wait to see it in person! The building process has flown by so far!! Since they broke ground, Dustin and I have tried to go see the house once a week to check on the progress. Every time we go there is something else done and we get so excited! Just today, I drove by and saw the exterior of the house was complete and I started to cry. It’s getting so real and I am so excited to start this new chapter of our lives in this home. I am so proud of what we are doing and I know there are many good things to come for us in this house. We are currently set to move in around early December and, as much as I despise moving, I know this move will be the most exciting one yet!